Professor Murray Watson is rather a sad sack. His family, his career, his affair…not even drinking offers much joy. All his energies are now focused on his research into Archie Lunan, a minor poet who drowned 30 years ago off a remote stretch of Scottish coast. By redeeming Lunan’s reputation, Watson hopes to redeem his own. But the more he learns about Lunan’s sordid life, the more unlikely redemption appears. 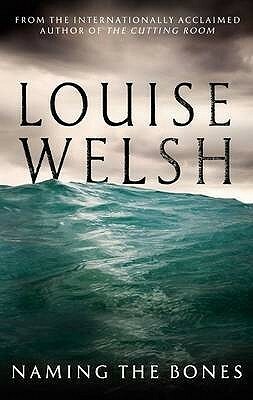 Louise Welsh, previously shortlisted for the Orange Prize, and winner of the Crime Writers’ Association Creasley Dagger, has written a dark tale of intrigue in ‘Naming the Bones’. Not the usual ‘who dun it’ type of crime novel, this book is dense with imagery and atmosphere. Welsh brings to life Murray Watson, a main character who is totally believable in all his flawed manliness. A philandering university professor in literature, Murray is researching the poet, Archie Lunan, in the plight of most university professors’, ’publish or perish’ dilemma. Murray also manages to have a fraught relationship with his brother, Jack, who is a visual artist. Jack and his female friends are woven into the mix ever so nicely just to make the story a little more complex. Set in Edinburgh/ Glasgow for most of the book, Welsh captures the mood, weather, and diversities within these cities. Half way through the book, just when you’re wondering where exactly Welsh is going with this tale, things start to move in a more sinister direction when Murray travels to a Scottish island as he seeks more information on his research subject. There’s meeting up with a mystery woman, whose life has intertwined with that of Murray’s dead poet, and the explosive twist that is the book’s finale. If you want Scottish atmosphere, read Welsh. And this book will give you great characters with settings to match.